This post was sponsored by Nabisco as part of NILLA Wafers an Influencer Activation for Influence Central and all opinions expressed in my post are my own. 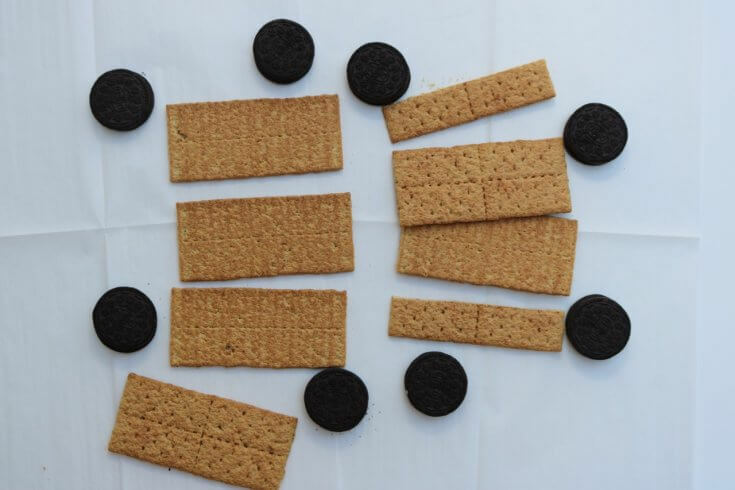 In this tutorial, I’m sharing How to Make a Graham Cracker Cookie Train Recipe.#SnackNShare, #IC Plus, NILLA Wafers is so excited about the Summer season, they’re giving away a $10,000 Cash Prize, and other daily prizes. Scroll down to enter. My kids love to read fun books about trains. 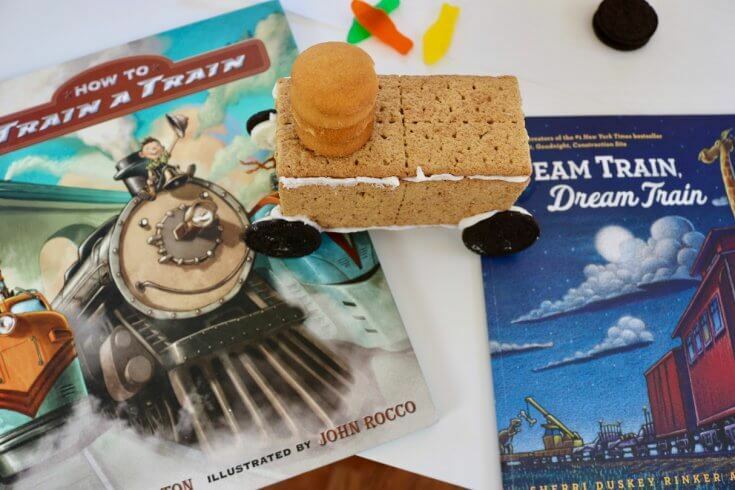 I’m featuring two of our favorite train books in the photos below. And if you’ve never seen it, you should really check out Dinosaur Train on PBS. Well this little fun summer activity was inspired by the books and the show, and is a great way to keep little hands and minds busy in a way that helps them learn about building in 3D. Plus, I can see how this can replace making gingerbread houses at Christmastime, it’s less expensive and more practical. 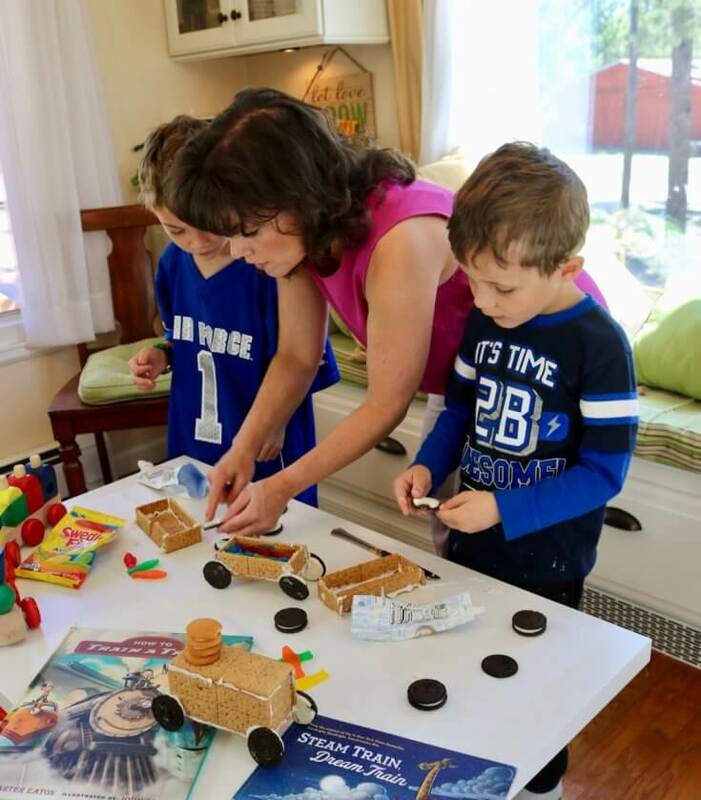 And, I’m taking photos of our family creating this Graham Cracker Cookie Train Recipe to enter us into the NABISCO Summer Snack ‘N Share sweepstakes! 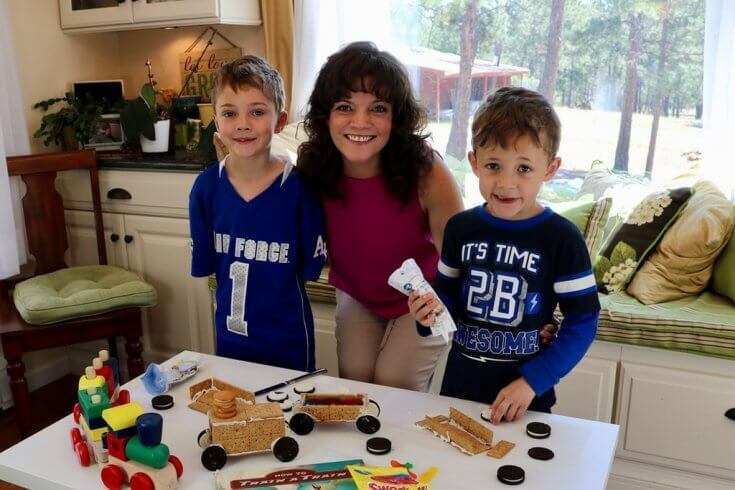 You guys, they are giving away $10,000 and other daily prizes; when you take the time to share an image of your family enjoying your favorite NABISCO products during summer events! I don’t know about you, but would I like to win $10,000? YES – Please! Enter now for a chance to win $10,000 and other daily prizes here: NABISCO Summer Snack ‘N Share Sweepstakes. Shop for your favorite NABISCO snacks all summer long at Walmart! Snap a photo of you and your friends/family enjoying NABISCO products (products must be shown in photo). Share your photos via social media with the hashtags: #snacknshare #sweepstakes for your chance to win $10,000 and other daily prizes. – WOOT! It creates a fun activity the whole family can enjoy. Total Bonus: This recipe creates a tasty, fun snack! Step 1: Arrange Train Cars. Imagine your train cars and side walls. 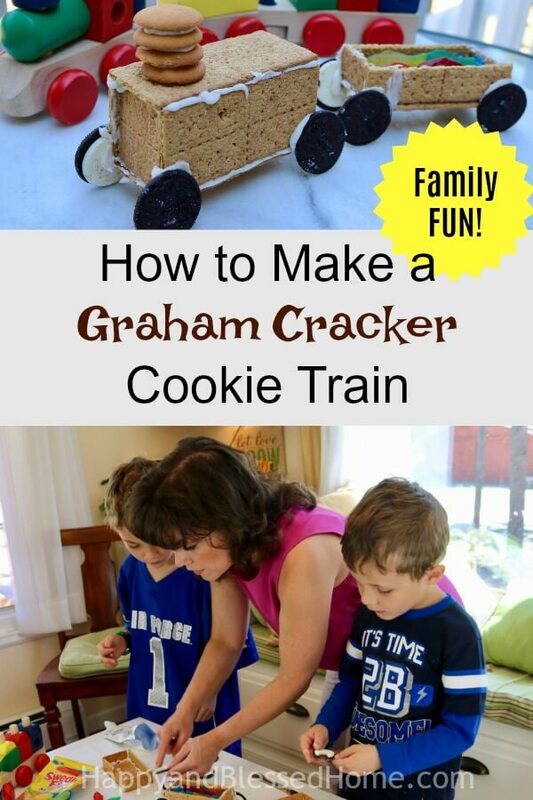 Use graham crackers for train base, sides, walls and top. Create a dry fit pattern. Step 2: Arrange the Wheels. I placed four OREO cookies around the train car as wheels. Step 3: Glue everything together. Use the white frosting in much the same way that you would use it to build a gingerbread house. Add icing “glue” around each edge and use stacks of cookies to hold pieces in place until they dry. Add extra supports inside the train cars for extra support. Step 4: Create the “water” car. 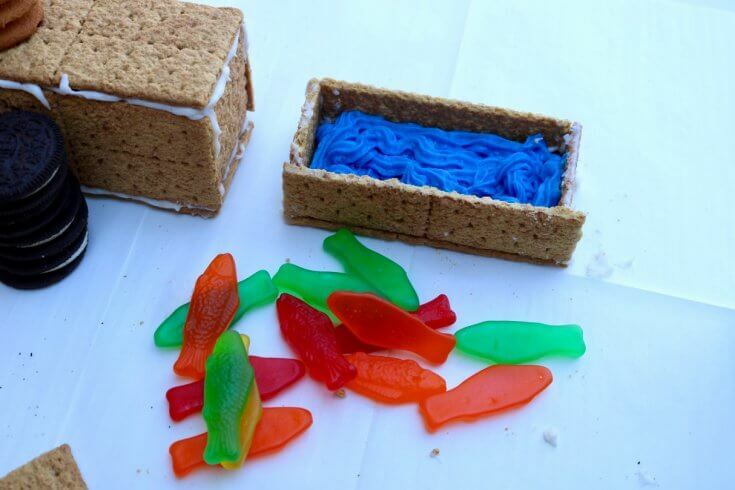 Add blue frosting and half fill the car with pretend “water” for the Swedish fish. Step 6: Add the Wheels. Add the OREO cookies on as wheels by carving out a small rectangular pie shape to fit the sidewalls into. Add extra icing to act as glue. Step 7: Add the smokestack. We used NILLA Wafers. Step 8: Add the Swedish Fish. AND Voila! 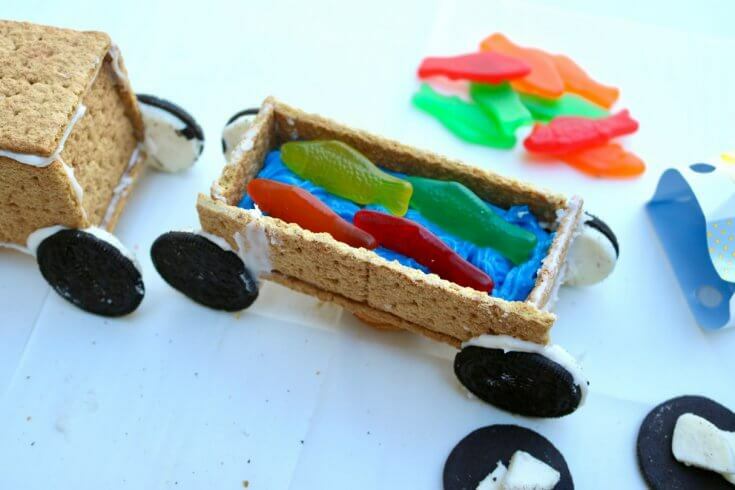 You have these adorable Graham cracker cookie cars! 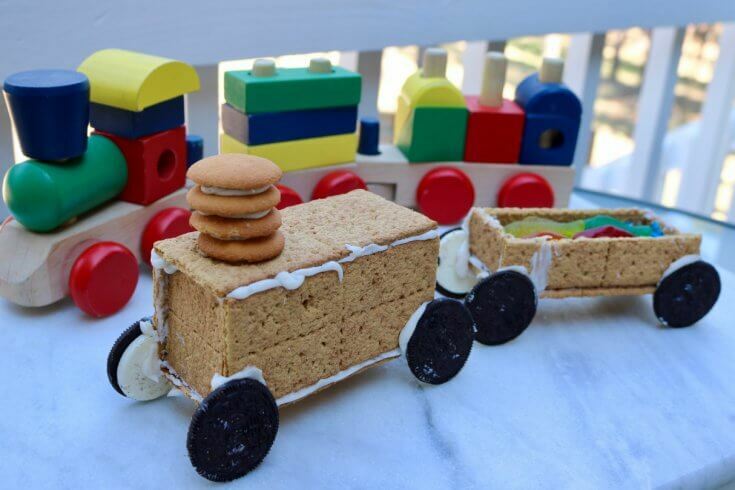 You can find everything you need to re-create this Graham Cracker Cookie Train Recipe at Walmart. You can find the NABISCO cookies on the cookie aisle. I’d love to hear about your favorite cookie recipe! Please leave a comment below. What’s your favorite way to enjoy family fun? Have any tips or tricks for easy family fun recipes? 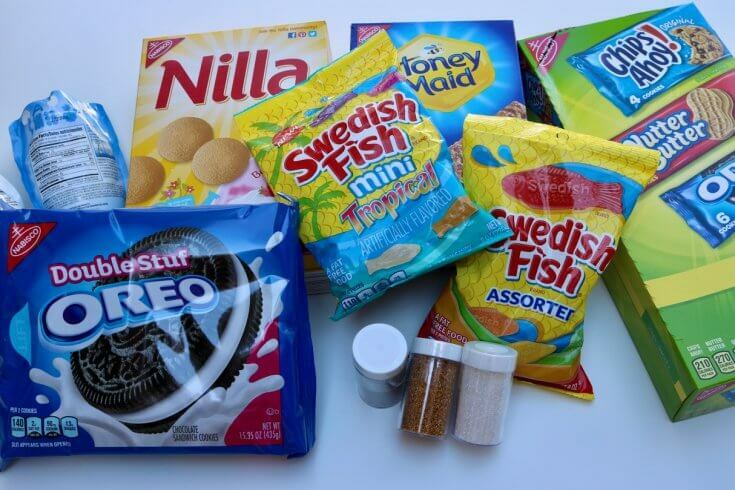 Can you envision some tasty treats using NABISCO cookies? 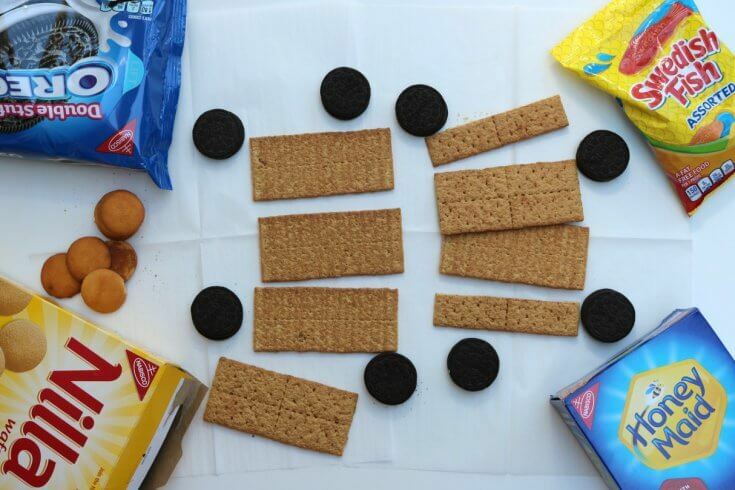 Check out the Snack ‘N Share Pinterest Board https://www.pinterest.com/nabisco/snack-share-summer-recipes for even more fun ideas. Please leave a comment below and join the conversation. I love hearing from my readers. Speaking of family fun, I have some wonderful activities for creating memorable family-fun over the warmest season of the year. These are some of the family fun posts loved by over 60,000 fans! Make sure to subscribe so you don’t miss any of my free printables, easy recipes, or games and activities for family fun! Enjoy easy recipes & family fun? Please help spread the wording by pinning this post on Pinterest!